I am very pleased to speak at this conference wich will certainly, bring up a lot of rich debates. I will introduce myself briefly. 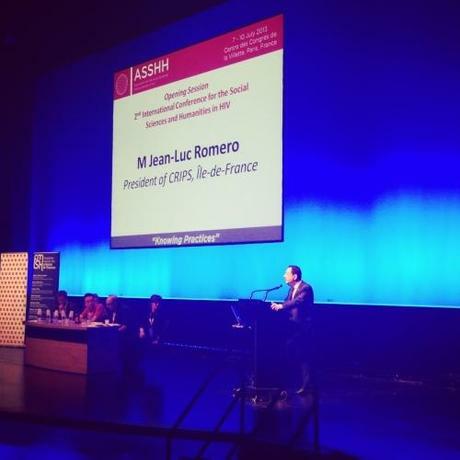 Elected regional Ile-de-France I am president of the Association Elected Leadership Against AIDS and of the regional center of information and prevention of AIDS in Ile-de-France. I am an activist. I am a person who has seen too many of his friends die. I am a person who lives with HIV. And i came up my HIV infection. I am affected by a disease that affects as much on the physical and social, individual and collective aspects. And this is that il would like to talk about. The answer to the fight against AIDS, of course, through the medical and scientific aspects and I want to praise the extraordinary achievements that we have reached si far. I think I can say that only in few pandemics, progress has been so rapid. The advent of HAART as well as the advent of biomedical prevention are two revolutions in this fight for life. The fact remains that on this question of the relationship between social science and AIDS issues have been, are and will be complex. I would like to say a few words about the disease, prevention but also about the people, especially people. - Lutte contre le sida : l’avènement de la parole du patient tout aussi importante que celle de l’expert, du médecin, de la blouse blanche. The fight against the disease is as well individual and collective. We are talking about the response to a virus and the interrogation about the structure of a society. The methods used in the fight against AIDS have permanently impacted and inspired many other struggles, both in terms of prevention, adcocacy that medecine support and I can even say that it has changed our society. However, 30 years after the discovery of the virus, it remains that the disease is taboo and stigmatizing. Because yes, AIDS is a disease that causes isolation, discrimination and poverty. A disease that makes its bearer a sub-citizen! - 30 ans après le début de l’épidémie : plus compliquée de dire sa maladie aujourd’hui qu’il y a 20 ou 25 ans. Exemple du livre « Paroles et vie au positif » : livre d’ELCS – très dur de trouver 13 personnes non-militantes acceptant de parler à visage découvert. - Pourquoi ? Poids de la culpabilité. - Une mise sous silence légitimée : ¾ des jeunes franciliens pensent qu’une personne séropositive a raison de cacher son statut sérologique pour éviter les discriminations. Solution à la discrimination : se cacher ! - Un silence qui a des répercussions sur la vie sexuelle : (enquête Vespa 2) 20 % des personnes séropositives n’ayant pas une charge virale indétectable ont eu au moins une pénétration non protégée au cours des 12 derniers mois précédant l’enquête. Une des raisons : difficulté de révéler sa séropositivité à ses partenaires. - Dire sa séropositivité est un acte militant. Pourquoi la société n’est-elle pas prête à entendre la parole de quelqu’un disant qu’il est malade ? Sida : la durée de vie s’allongeant se pose forcément la question de la gestion de la vie avec le virus. - Vie sociale marquée par l’isolement : un fort taux de personnes séropositif (40 %) vit seul. - Quid de la prise en compte du vieillissement ? Thème commence seulement à être pris en compte. - Une personne sur cinq rencontre des difficultés à se nourrir au quotidien par manque d’argent. I drew the conclusion, a tough but realistic observation. A bitter fact, this observation tells us that the AIDS stigmatizes, that AIDS isolates, that AIDS results in poverty. An observation centered on France wich also applies to many other countries . I did not want to be exhaustive giving you just a few facts, some data that affects me deeply. Obviously, this finding is sufficient in itself to justify the urgency of our response. But the answers are of course not unique and you'll have a long discussion and rich debates on the subject. There is no one single truth. I want to tell you my opinion: I think the response to HIV / AIDS is political. Political attention and not politicized. How so? I think it is our aim to develop a society where HIV-positive people can talk about their HIV Infection without risking stigma and discrimination. It behooves us to develop a society where health policy is pragmatic and non-ideological. It is our duty to set up a society where access to treatment and care is guaranteed, a necessity for the control of the aids epidemy, on the individual and alos collectiv aspects. It is our duty to set up a society where human rights are respected in their entirety and the sexual orientation is not the basis for a criminal offense. It is our duty to set up a society where prejudice will be replaced by truths, assuming a real and ambitious policy of education and information. We need a greater awareness. Well, I think this is just how we achieve our goal, a goal that we know ambitious but not impossible: the end of AIDS.